1. Dissolve the yeast in lukewarm milk. In a large bowl, combine flour, sugar, matcha and salt. Add the egg and butter and pour in the milk with the yeast. Knead everything thoroughly until a smooth dough is formed. Then let covered 1 hour in a warm place. 2. Mix the poppy seeds with milk, sugar, honey, butter and durum wheat semolina in a saucepan and heat over medium heat and stirring, but do not cook properly. 3. If the mass thickens, remove from the heat and allow to cool briefly. Then stir in the egg and heat briefly again. Remove from the heat and stir in the vanilla pulp and amaretto. Allow the mass to cool slightly before reuse. 4. Preheat the oven to 180 ° C. Now it's time to roll. On a floured work surface, roll out the risen yeast dough with a rolling pin as far as possible rectangular (about 30 x 40 cm). Brush the dough with the poppy seed mixture, leaving a narrow margin around. Carefully roll up the dough from the short side. Cut off about 1 cm from both ends so that the roll ends evenly. Then cut the dough roll in half lengthways to create two long dough strands, each with an open side to the center. Turn the open sides upwards and intertwine both strands compactly. Carefully lift the yeast custard into a tin box lined with parchment paper and bake on a medium rack in the oven for approx. 50 minutes. 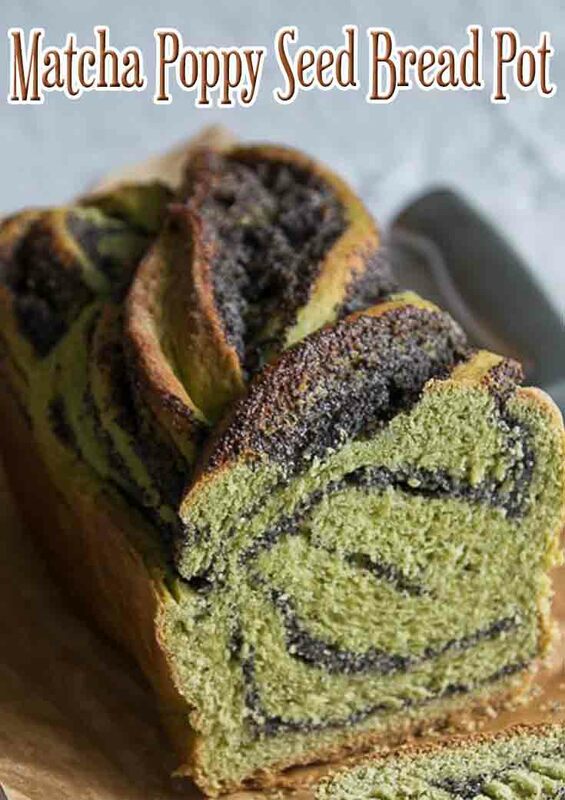 After half of the time, cover the matcha poppy seed with baking paper, so that the surface does not get too dark. Take the braid out of the oven and lift it out of the mold together with the baking paper. Only when it has cooled completely, the braid can be easily cut into slices.